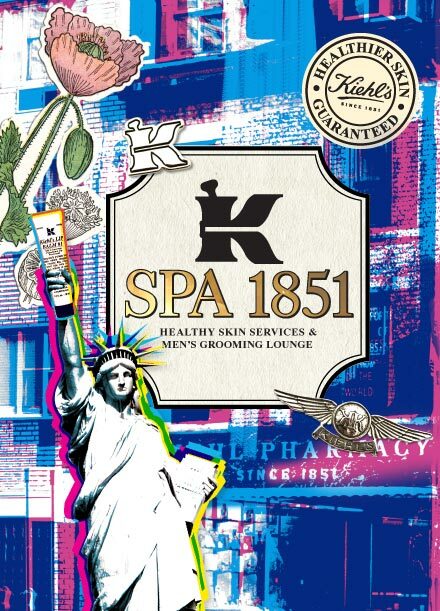 A few weeks ago, I had the supreme pleasure of visiting the Kiehl's Spa 1851. This spa is located (very conveniently) only three blocks from my apartment -- and yet, it took me YEARS before I finally went in for a treatment. Well, thank goodness I did, because my skin has never looked or felt better! Each of the treatment rooms at the Kiehl's Spa 1851 is themed, with art by Curtis Jinkins and David LaChapelle. I was in the Rainforest Room, which incorporates Kiehl's history of sourcing the finest natural ingredients from around the world into a mural on the wall. Each of the rooms also features tin ceilings and antique fixtures -- and, of course, the entire Kiehl's product line. This treatment incorporated all of the standard steps one might expect during a facial -- cleansing, exfoliating, extractions, a mask -- with one major difference. At the end, MY SKIN LOOKED AND FELT INCREDIBLE. It was softer, it was smoother, it was downright glowing. This is thanks both to the Kiehl's Super Multi-Corrective Cream and to the collagen mask my esthetician used, which works to maintain elasticity and prevent premature aging. There are multiple facials and body treatments to choose from here, some even customized just for guys. They range in price from $90-$330. For more information about the Kiehl's 1851 Spa and to book an appointment, visit kiehls.com. That looks amazing! Love the rainforest room!